, author of a History of England on a new plan, which has been generally and highly approved, was the son of James Henry, a farmer, at Muirtown in the parish of St. Ninian’s, Scotland, and of Jean Galloway his wife, of Stirlingshire. 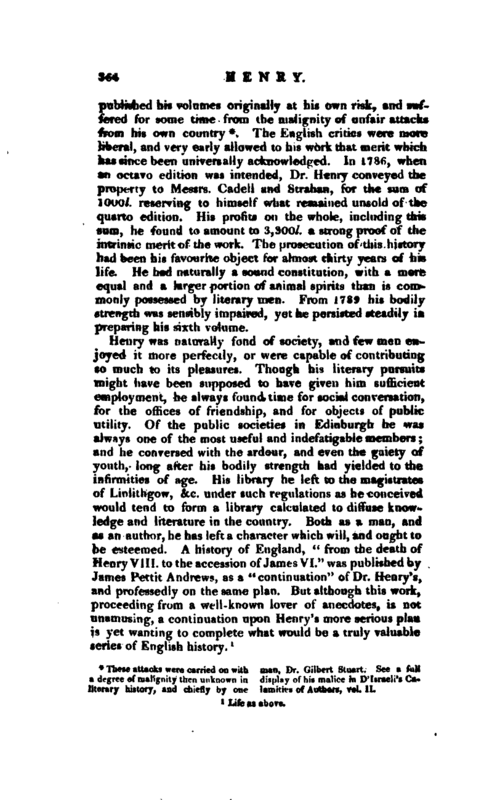 He was born on Feb. 18, 1718; and, having early resolved to devote himself to a literary profession, was educated first under a Mr. John Nicholson, at the parish school of St. Ninian’s, and for some time at the grammar-school at Stirling. He completed his academical studies at the university of Edinburgh, and afterwards | became master of the grammar-school of Annan. 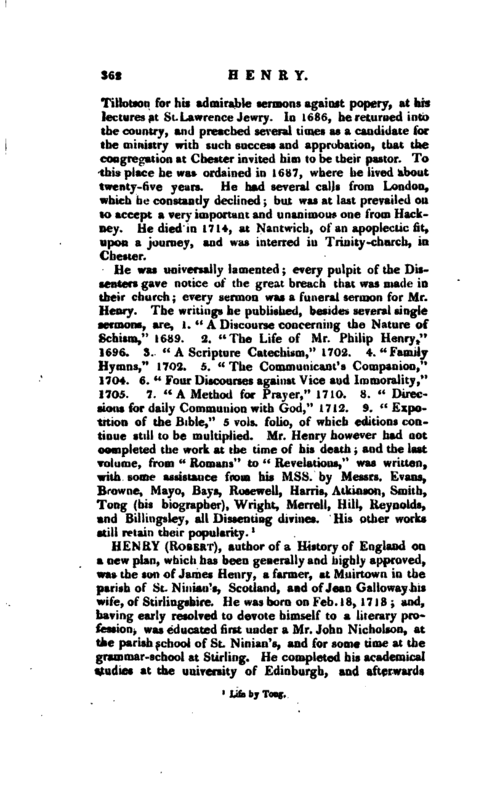 He was licensed to preach on the 27th of March, 1746, and was the first licentiate of the presbytery of Annan, after its erection into a separate presbytery. Soon after he received a call from a congregation oi presbyterian dissenters at Carlisle, where he was ordained in November 1748. 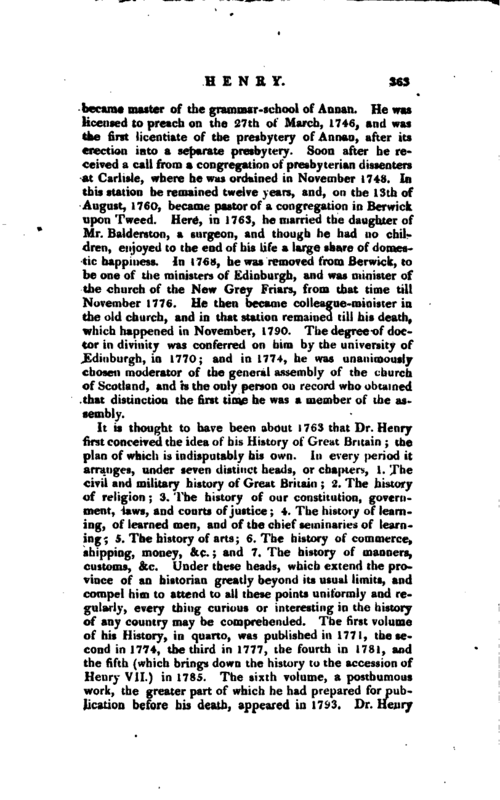 In this station he remained twelve years, and, on the 13th of August, 1760, became pastor of a congregation in Berwick upon Tweed. Here, in 1763, he married the daughter of Mr. Balderston, a surgeon, and though he had no children, enjoyed to the end of his life a large share of domestic happiness. In 1768, he was removed from Berwick, to be one of the ministers of Edinburgh, and was minister of the church of the New Grey Friars, from that time till November 1776. He then became colleague-minister in the old church, and in that station remained till his death, which happened in November, 1790. The degree of doctor in divinity was conferred on him by the university of Edinburgh, in 1770; and in 1774, he was unanimously chosen moderator of the general assembly of the church of Scotland, and is the only person on record who obtained that distinction the first time he was a member of the assembly. These attacks were carried on with a degree of malignity then unknown in literary history, and chiefly by one man, Dr. Gilbert Stuart. See a full display of his malice in D’Israeli’s Calamities of Authors, vol. II. The English critics were more liberal, and very early allowed to his work that merit which has since been universally acknowledged. In 1786, when an octavo edition was intended, Dr. Henry conveyed the property to Messrs. Cadell and Strahan, for the sum of 1000l. reserving to himself what remained unsold of the quarto edition. His profits on the whole, including this sum, he found to amount to 3, 300l. a strong proof of the intrinsic merit of the work. The prosecution of this history had been his favourite object for almost thirty years of his life. He had naturally a sound constitution, with a more equal and a larger portion of animal spirits than is commonly possessed by literary men. 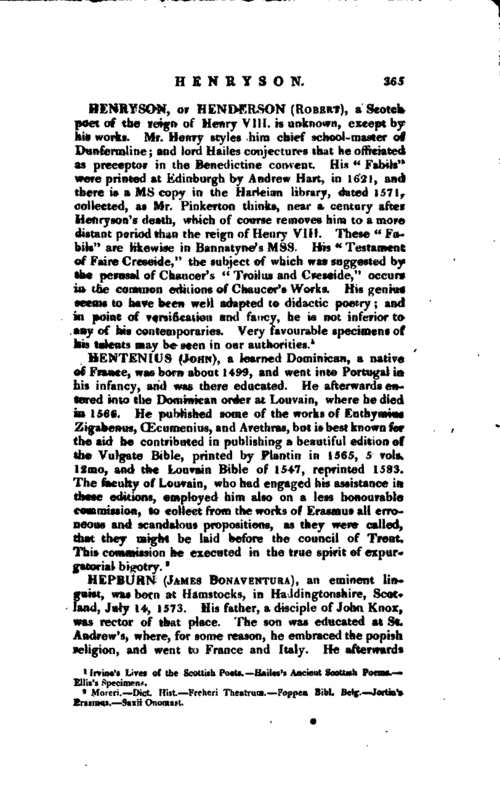 From 1789 his bodily strength was sensibly impaired, yet he persisted steadily in preparing his sixth volume.